There are only a few films that feature clowns that I find actually entertaining, but now I can add the film Clown to my list. 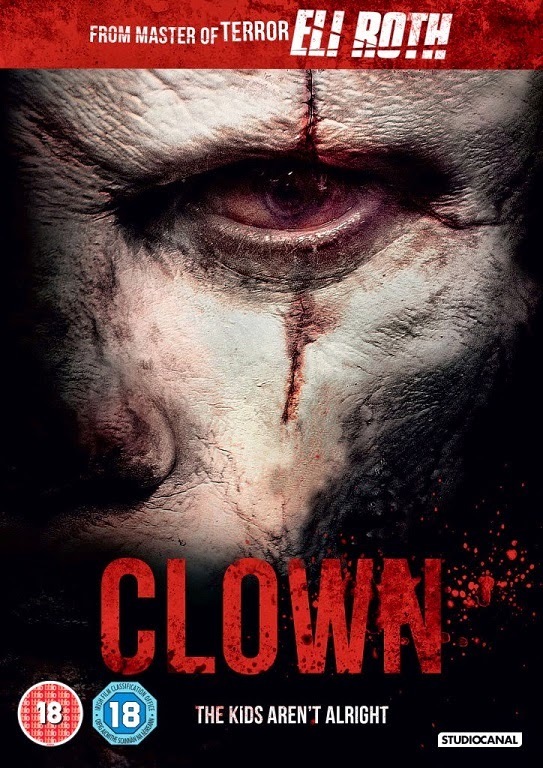 Clown started out as a movie trailer made by aspiring horror writer/director Jon Watts. When Hostel director Eli Roth saw this cheeky bit of calling card, he got on board to help Watts spin his twisted trailer into a full on feature-length film. Watts penned the pic with Christopher D. Ford, and together they crafted a clown story unlike any told before. Think 'Rare Exports', but instead of Santa you have the Clown. A loving father finds himself in a jam when a clown is needed for his son's birthday party. Luckily he finds a clown suit in one of the homes he is selling and quickly returns home to entertain the child. When the fun is over and he tries to remove the "costume" he finds that it is not a costume at all, but an evil cursed object that is slowly taking him over. There are two stories being told in this film. The father's, Kent, who is our unlucky fool who puts on the clown costume. Then there is his family's story of dealing with the fallout from the costume. The latter isn't very important, it just helps flesh out the story, but the father's transformation from average dad to killer monster is very enthralling. This is the heart of the movie and what makes it so damn good. Andy Powers (OZ, ER) plays the role of the father Kent. He is the star of this film and it is his story that we should focus on. Powers transformation from everyday man to the monster is well acted and plays out in a way that you really feel bad for the character. Powers really shines in this role and approaches not as a horror film, but a legit film in general. This role is so pivotal that had he not played it straight, the whole thing could have fallen apart. Surprisingly Powers isn't the only strong actor in the film, Peter Stormare ( 22 Jump St, The Last Stand) shows up and delivers a performance that only he can deliver. The man never phones it in and gives 110% to every role regardless of its size. Stomare plays Karlsson, the man in charge of giving the back story and the only one who knows how to stop the transformation. Stomare is brilliant at what he does and the realism he brings to his role only adds to this movie's awesomeness. Lauren Allen (4400, Ravenswood) gives a great performance as the mother/wife, Meg, who is trying to figure out if her husband is crazy or telling the truth. She is able to turn her character on a dime and, at one point, she seems to be on the same level of evilness as The Clown. The actors may have made the film good, but Jon Watts made the film awesome. His ability to write a screenplay that makes IT (from Stephen King's IT) look like a pu**y when compared to this Clown is nothing short of spectacular. Watts knocked it out of the park on his first outing as a feature writer/director and that is a feat very few could pull off. The film is loaded with Practical FX and the work done by Raymond and Rosalie Mackintosh are outstanding. The design for the creature is so sick you can only hope that the IT upcoming remake comes close to it. Out of all the clown looks out there this definitely places in my top five of all time. The movie is packed with awesomeness galore and is a clown horror fans dream come true. This film has reinvigorated a sub-genre that is a miss more often than a hit and this movie for me is a solid hit. The only downside, as stated before, is the slow parts of the family dealing with the father going missing and them believing he's crazy.